It’s a scam so well orchestrated that it’s easy to understand why people are falling for it. 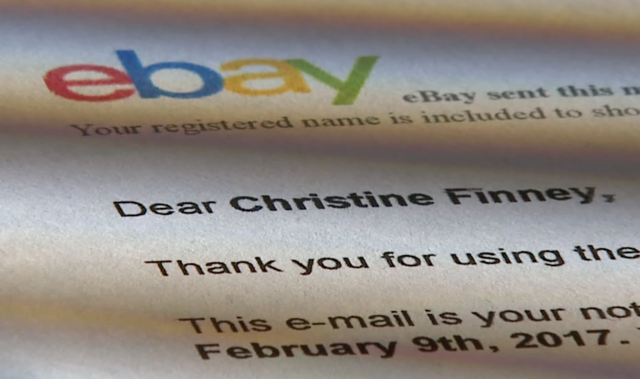 Scammers claiming to be from eBay are targeting people in our area and the crooks are getting away with big money. "The price looked good. The car looked good and I was like 'Wow!'" said Chrissy Finney from Akron. She thought she was buying a Rav4 off of Facebook Marketplace. The "sellers" told her she had to go through eBay to buy the car. They even sent her an email with the eBay logo and a number she had to call. "They answered 'eBay,'” Finney told us. The price was just $2,000. Finney asked about the price. "They used the excuse that her husband had just died and it was just too many memories and she just wanted to get rid of the car,” said Finney. They told her to put the money on eBay gift cards, call them with the numbers, and the car would be delivered in a few days. She did all that, but the next day when she had a quick question about the car, there was no one to ask. “I'm calling both numbers on the email and neither one is valid anymore." She then called the real eBay. They said they would investigate. Meanwhile, Finney called Akron police. "And (they said) I could file a report or not file a report… it's not going to get me my money back. That's just a lesson." "Some of these we've seen people lose $10,000, $12,000, $20,000," Lt. Rick Edwards from the Akron Police Department told News 5. He also said they've tracked these kinds of cases to overseas countries and it's difficult to work with them to get the bad guys. Plus, the crooks use technology to scramble IP addresses sometimes a thousand times over. We asked Lt. Edwards why the good side of the law can’t get ahead of the criminals. "I wish I could tell you," he said. "I think technology is advancing so fast that police agencies and local government is not keeping up quickly enough." It’s not good news for Finney and her husband Jaland. “This is a crime that is, not only unpunished, uninvestigated,” he said. "If they tell you to go buy gift cards and call a number…don't do it because you'll be out of money just like I was,” warned Chrissy. We have reached out to eBay for comment on this case and what kind of investigation the company conducted.